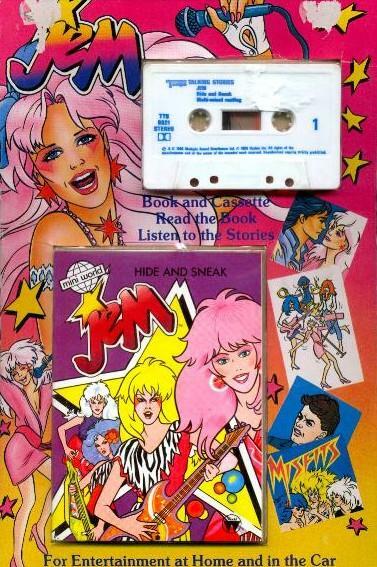 Not only did Jem have a doll line, fashion for the dolls, coloring book, board games, View Master, and more, but there was also books! Description: Congratulations, Jerrica! Starlight Music just won an incredible award. Unfortunately, it seems that Rio has moved beyond his feelings for Jem and Jerrica. Can Jerrica discover what is going on before it's too late? Description: The Holograms are scheduled to perform the grand opening weekend at an exclusive new club. But when disasters occur each night, who could be responsible? 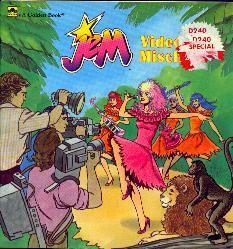 Description: Jem and the Holograms are invited to a fashion shoot and decide to bring Ashley with them. But when Ashley starts feeling neglected she decides to sabotage the clothes for the shoot. Will Ashley's need for attention ruin the fashion show? Description: Jealous of the Holograms (who are shooting a new music video), the Misfits decide a little sabotage is in order. Can the Holograms recover from the Misfits' video mischief? Description: Basically the first 5 episodes. Description: Kimber's enjoying her Hologram fame and now allows crowds of fans. The Misfit use Kimber's display arrogance to steal the JemStar earrings. In a sea of fan all wearing copies of the earrings, can the Holograms hope to find the real ones? Maybe an unlikely ally can aid them! Description: Eric Raymond is back! He begs Jerrica to allow the Misfits perform at the Holograms World Peace concert to get him back in the Misfits good graces. But when they agree, he arranges such a media hype that the Misfits get all the credit and glory for the concert (including a meeting with the President). Has Eric obtained his goal? Or does he have something more sinister in mind? Description: YOU are JEM! The Misfits claim you stole the priceless Langley jewels. You must prove they're wrong! Description: YOU re JEM! The Misfits kidnap and English Princess- and blame it on you! You have to find her! Description: YOU are JEM! A sneaky businessman wants to destroy beautiful Rainbow Island-- and only you can stop him! Description: A dream cruise turns into a nightmare when the world famous Van Diore diamonds are stolen and Jem is the chief suspect. Description: Millionaires...mansions...fast cars...family feuds. Jem joins the jet-set dream world when she is asked to take part in a top rating soap opera. Description: Donna Maddon is a bad mannered brat. 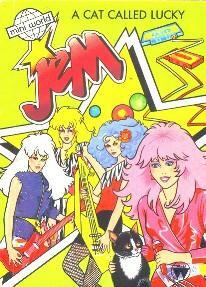 Somehow she wins a kids' talent contest and gets to meet Jem and the Holograms. Description: Eric Raymond wants to turn some kids out of the building used for a youth club disco. How can Jerrica Benton and Jem stop him? 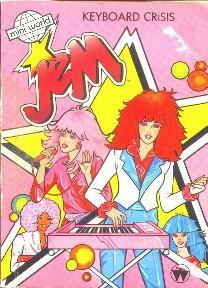 Description: Pizzazz hires her news reporter cousin to snoop on Jem. When she witnesses Jerrica entering a room and Jem later exiting, has she accidentally discovered Jem's secret? Description: At a local club, Jerrica has her JemStar earrings stolen by the Misfits. Is there anything her friends can do to help get them back? Or will a stressed, over-pressured, over-worked Jerrica give into her darker thoughts and join... The Misfits??? Description: Is Kimber going solo? 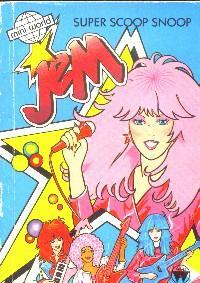 Could this be the beginning of the end for Jem and the Holograms? And what is Eric Raymond's latest evil scheme? 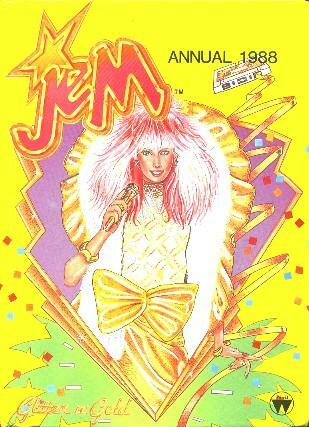 Description: Jem discovers a little black kitten named Lucky on the street. It takes a quick liking to only her (hates everyone else) and she decides to keep it. Meanwhile, Eric Raymond is up to no good. Can Jem discover the secret of the kitten's love of only her while avoiding Eric's schemes? Stage Management - The Holograms are invited to play at a fantastic new concert hall built into the side of a cliff. Jealous of the attention they are receiving, the Misfits sabotage the concert just before the Holograms arrive. Can Jerrica come up with a way to save the day? Marbo - The Rock Movie - The press is abuzz about this new sensation. No one has met the mysterious Marbo and Jem and the Holograms are scheduled to appear in a movie with him. When they meet the less than "ULTIMATE ROCK STAR", can Jem help him live up to his calling? Two-Timing - Rio asks Jem to go out to a fancy restaurant, while Jerrica has to settle for fast food romances. Is Rio planning to dump Jerrica for the Truly Outrageous Jem? Rockin' Roadsters - A concert is being given and both the Misfits and the Holograms accidentally get top billing. To settle matters, the Misfits suggest q cross country race with winner take all rules. Will the Holograms win or do the Misfit have one too many tricks up their sleeves? In The Beginning - First 5 episodes basically. Desperately Seeking Synergy - Has a nosy reporter discovered Jem's secret? Starry-Eyed! - A Horoscope page. Jem's Exercise Routine - Exercises that keep Jem in shape. Here's Looking At You! - Information about your improving your looks. Jewelry Gems - Shows how you can make your own jewelries cheap. Night Of The Dolphins - When the Holograms are scheduled to play at the Sea Blaze Marina, the Misfits have Zipper 'sink' the concert and the Holograms must rises to the occasion. Queen For A Day - On the day of a Jem and the Holograms look-a-like contest, a young girl accidentally drops her ticket into a street mailbox. Can anyone help the poor girl out? Prince Rat - Rio and Jerrica meet a young girl who ran away from her orphanage after being accused of stealing and she tells them that she didn't want to get her friend in trouble. However, when she goes to Starlight Mansion and run away when concert tickets go missing, everyone wants to know if she is truly a thief? Playing With Fire - The Holograms home is 'accidentally' set on fire (a botched up robbery by Zipper). The Holograms hold a concert to raise funds to repair their home, The Misfits, jealous of the media attention, scheme to wreck the concert. Gold Gets Going - The Holograms go to South America to film the Glitter N' Gold Video. Two Kinds Of Courage -The Holograms find a mysterious young girl in their van and decide to take care of her. Is this girl an unfortunate orphan or a part of The Misfits latest scheme. Higher and Higher! - During a major Holograms concert, The Misfits show up and cause trouble which lands (or in this case, rises) Jem into trouble. She's A Natural - A page about how Jerrica keeps her hair and face in shape. So far, 1500203 visitors (4901534 hits) truly outrageos people have been on this page!